A reader wrote in wanting suggestions on what to wear on a first date to Six Flags. It is in Georgia so the weather will be hot, and she's 28 years old. Here are the ideas I sent her, click on any image for more information. My initial idea was to do an outfit with a romper, you get the girlie look of a dress but you don't have to worry about flashing people while you're on the rides. I wasn't sure if the reader preferred wedges or flat sandals (obviously wedges wouldn't be best for a whole day at Six Flags but I assume a first date isn't going to be 8 hours long - so the wedges would work for someone who is used to/prefers some height on their shoes and if the date is just for a few hours), so I included both in this set. Some simple jewelry (you don't want dangling earrings or a huge necklace smacking you or your date in the face while on a ride) and sunglasses complete the look. I also found some additional rompers that I thought would be cute, see the widget below. For this second look I chose a simple, lightweight button down (roll up the sleeves!) paired with some cut offs for a classic American look. 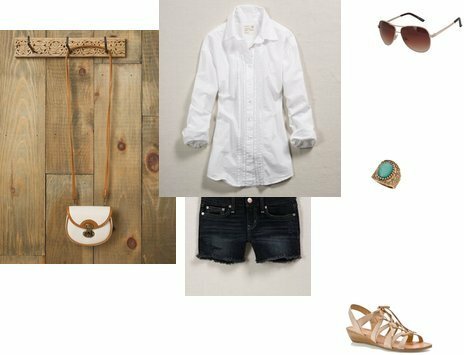 Add cute sandals, a bright ring, and some aviator shades and you're ready to go. I also threw in a crossbody bag with this set, that would probably be the best option if you're wanting to bring a handbag of some kind. I for one could never get through a whole day at Six Flags in those wedges. If it's just a nighttime date, she might be fine, but the flats are a much better option.